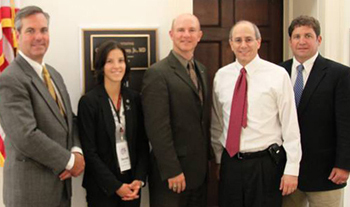 Congressman Charles Boustany, Jr., MD meets with maritime industry and labor representatives during the second annual Maritime Industry Congressional Sail-In May 4 in Washington, D.C. With Rep. Boustany here are American Maritime Officers member Capt. Robert Lansden (third from left) and President of CEO of Pacific-Gulf Marine Todd Johnson (left). Also in the picture are Sarah Branch, director of government relations for the Offshore Marine Service Association (OMSA) and OMSA President and CEO Jim Adams. Representative Charles Boustany (R-LA) praised the 91 members of the House of Representatives who have co-sponsored the Realize America's Maritime Promise (RAMP) Act. In a statement released after a meeting with maritime representatives during the Maritime Industry Congressional Sail-In May 4, Rep. Boustany commended his colleagues for their support of H.R. 104. The legislation would require Congress to each year appropriate funds deposited in the Harbor Maintenance Trust Fund (HMTF) for their intended purpose: maintenance dredging of U.S. ports and navigational channels. Annually, the HMTF - funded by the Harbor Maintenance Tax, which is assessed on imported and domestic cargo - accrues more than $1 billion, but only approximately half of those funds are used for maintenance dredging. This has created an enormous surplus, while the nation's ports and waterways continue to degrade. The Great Lakes navigation system, in particular, has suffered from a lack of maintenance dredging in recent years. "Louisiana is a global leader in trade, and proper maintenance of our ports is critical for our exports to grow," Rep. Boustany said.